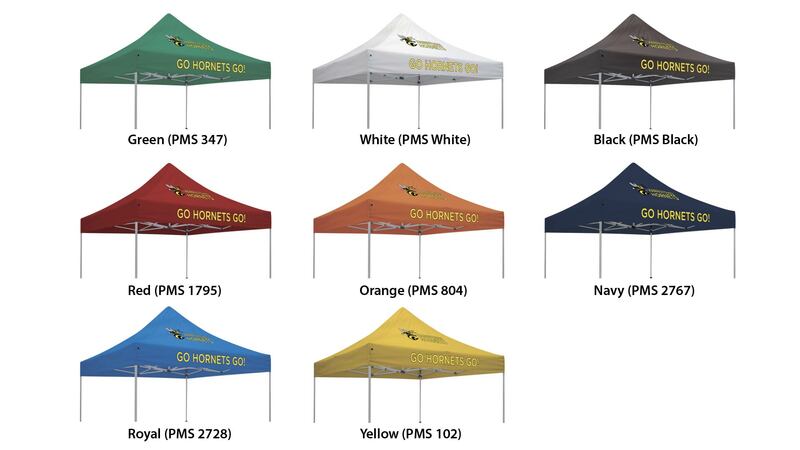 If you are ordering a custom printed canopy tent for this season's outdoor events, the following should help you figure out which tent and imprint method best fit your needs. We have standard square widths of 6ft, 8ft, 10ft, and longer lengths of 15ftx10ft and 20ftx10ft. All of our tents are made with a sturdy retractable frame, water resistant canvas canopy and come with a rolling carry bag and ground stakes. Your custom tent will last for years if cared for and stored properly! Replacement canopies are available for your new marketing message to be applied! Already have a tent from us? Watch our Tent Set Up Tutorial HERE! We have standard square widths of 6ft, 8ft, 10ft, and longer lengths of 15ftx10ft and 20ftx10ft. Typical outdoor events allow for a 10x10 canopy tent. 1. All over Print (Dye Sublimation): This process covers the ENTIRE surface of the canopy with your design. As you can see below, your brand can take a much different form than a traditional imprinted tent. 2. Full Color Imprinted (Heat Transfer): This method allows us to print your logo in full color on two basic areas of the canopy: the peak and the valance. 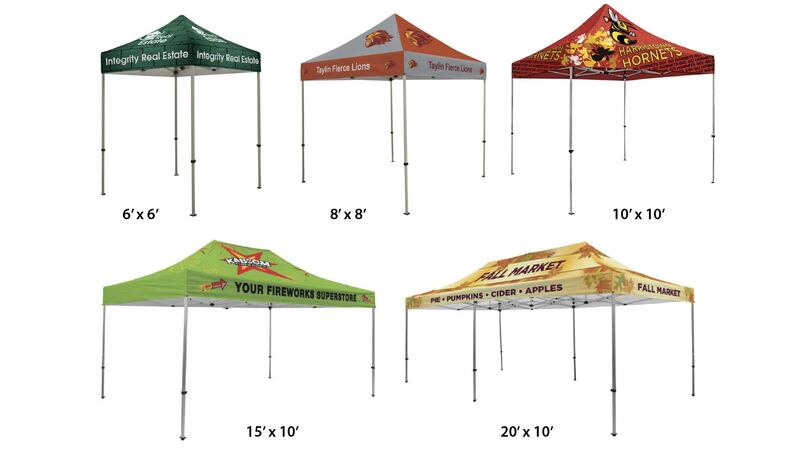 You may choose to print on one, two or up to eight areas on the tent. We have 8 fabulous canopy colors to choose from. For Heat Transfer Imprinted Tents, you may choose up to 4 Peak Imprint areas and 4 Valances. Note that we can imprint different graphics on each imprint area! All over Dye Sublimated Tents print over the ENTIRE surface, so the sky's the limit on what you can design! Use our template (via the link below) to lay out your art, or give our design team a call if you need assistance! Add even more impact to your tent display with walls and windows! Give us a call for all of the options- there are many! Let us help you configure your perfect outdoor tent display! Contact us via chat below, email, or by calling 571.299.6908. Already have a tent from us? Watch our Tent Set Up Tutorial!